Starring: Marlon Brando, Al Pacino, Robert DeNiro, et al. >>>This is a multi-unit set and the shipping cost will be adjusted to that of 4 DVDs. To learn more about the shipping cost, please visit our Help Page and look for shipping information. 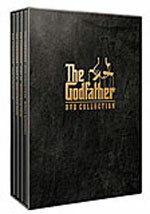 Some of the greatest masterpieces in cinema history, "The Godfather Collection" is the saga of the generations of successive power within the Corleone crime family, told in three films of staggering magnitude and vision, masterfully exploring themes of power, tradition, revenge and love. "The Godfather" (1972, 175 min.) - Adapted from Mario Puzo's best-selling novel, Francis Ford Coppola's epic masterpiece features Marlon Brando in his Oscar-winning role as the patriarch of the Corleones. Director Coppola paints a chilling portrait of the Sicilian clan's rise and near fall from power in America, masterfully balancing the story between the Corleone's family life and the ugly crime business in which they are engaged. Winner of three Academy Awards, including Best Picture. "The Godfather, Part II" (1974, 200 min.) - This brilliant sequel continues the saga of two generation of successive power within the Corleone family. Coppola tells two stories: the roots and rise of a young Don Vito (Robert De Niro), and the ascension of Michael (Al Pacino) as the new Don. Winner of six Academy Awards, including Best Picture. "The Godfather, Part III" (1990, 170 min.) - Now in his 60's, Michael Corleone is dominated by two passions: freeing his family from crime, and finding a suitable successor. That successor could be fiery Vincent (Andy Garcia), but he may also be the spark that turns Michael's hope of business legitimacy into an inferno of mob violence. This special collection also includes an additional disc containing over 3 hours of bonus material. 1. The Godfather - Francis Ford Coppola's epic masterpiece features Marlon Brando in his Oscar-winning role as the patriarch of the Corleones. This is a chilling portrait of the Sicilian clan's rise and near fall from power in America balanced between the Corleone's family life and the crime business in which they are engaged. 2. The Godfather Part II - This sequel continues the saga of two generations of successive power within the Corleone family, detailing the roots and rise of a young Don Vito (Robert DeNiro) and the ascension of the new Don Michael (Al Pacino). 3. The Godfather Part III - Michael Corleone, now in his 60's, is dominated by two passions: to free his family from crime and to find a suitable successor. 4. A 3-Hour Extraordinary Bonus Disc Produced Especially For This DVD Collection!